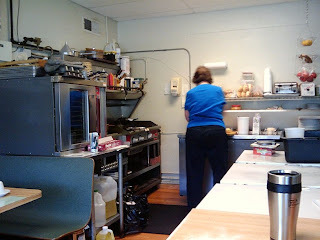 I have written about a quaint little eatery in Cuyahoga Falls, Ohio, called Flury's Cafe twice now. However, I have eaten there probably a half-dozen times since my first visit. I don't know that I want to document every single visit with a blog post (nor do I think you would want to read about every single visit), but I figured that a single post about some of the breakfasts I've had would be a good use of our time together. Today I'll talk about a breakfast I ordered off the regular menu and one that came from the daily specials. On my first visit to Flury's, I mentioned how very small the space was. The seating consists of two four-top tables and a series of stools around a lunch counter. However, what I don't know is if I captured effectively in my description was the size of the grill/fryer/prep area that Kim, owner and cook, has to deal with when making those inspired and tasty dishes. On the day that I visited, Kim's mom had actually stepped in and taken over the cooking duties for the day. This was taken by me sitting at the corner of the lunch counter. To the right of the prep area was a dish washing station. Behind me was the front wall to the restaurant. The place is TINY to be sure. Fortunately, in all of my visits, I have tried to go at off times and have been rewarded with a usually fairly empty restaurant, so I've never had a problem getting a seat. The same may not be said for Saturday mornings. For my first visit of the entry, I decided on going with a regular menu offering, the #16 from the breakfast menu. This consisted of a biscuit with gravy, hash browns, and eggs cooked to my request. 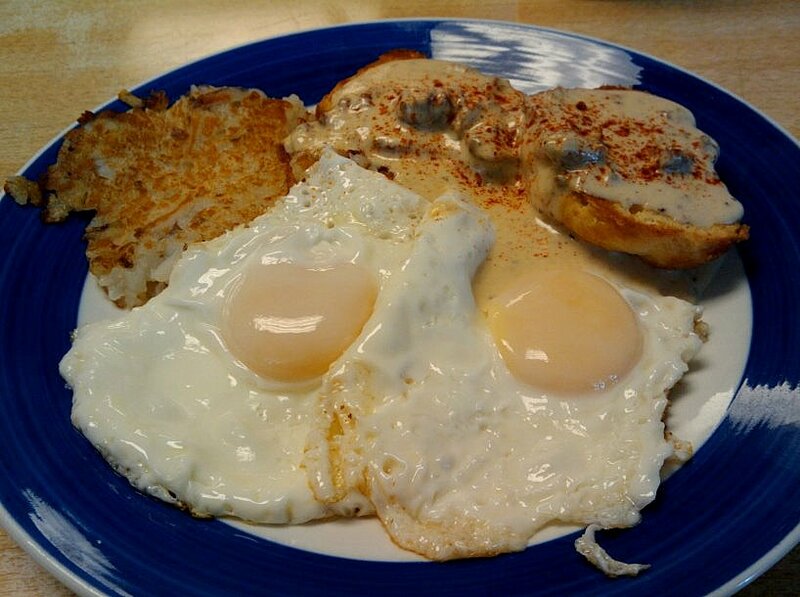 I had seen the biscuits and gravy on the menu during earlier visits, but it wasn't until now that my curiosity was piqued enough to order them. When my server asked how I'd like my eggs prepared, I asked for sunny side up. She responded and said, "How about basted instead?" Memories of my grandmother's butter basted eggs suddenly flooded my brain and I quickly agreed. As I sat there watching today's cook prepare my meal, I noticed several interesting items. First, she was using some type of oil in a squirt bottle to not only coat the grill, but to brush the split biscuit before grilling. I asked her about it later and she said that it was a butter and canola oil blend, which when she made it was closer to a 25% butter and 75% canola blend. When Kim made it, the butter content tended to be a little higher. The other interesting item I noticed was that when she went to prepare a serving of the sausage gravy, she actually finished the gravy with heavy cream. 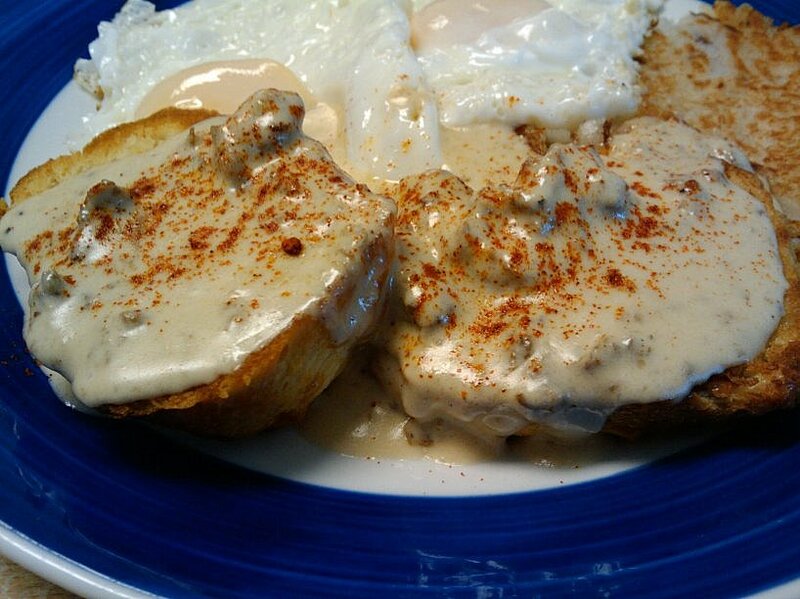 That was a twist to sausage gravy that I hadn't seen before. Because of the incredibly high standard set in previous visits, I was a little surprised that I had a few minor quibbles about the above plate of food. The eggs weren't seasoned at all. That being said, this was actually consistent with eggs I have ordered here before, so it wasn't a surprise. What was a surprise about the eggs was that based on my definition of the word "basted," these definitely did not like up to that adjective. Basted to me means that after you add the fat and crack in your eggs, you spoon the fat over the tops of the eggs until they are cooked. What Flury's had done was to crack the eggs on the fat on the grill, and then finished them by shooting a squirt of water onto the grill and covering it for fifteen seconds or so with a cover, thus cooking the tops of the eggs, too. That being said, once I added salt and pepper, the eggs were tender and delicious and the yolks nice and runny. The other minor quibble was about the hash browns. The irregular chunks of potato clearly indicated that they were homemade, but they needed just a bit more salt. While you can see from the picture above that they were clearly griddled, they needed just a bit more time to add that textural contrast so that the outside was nice and crunchy and the inside nice and creamy. The freshly made biscuit had been split, brushed with the butter/canola blend and then griddled to not only reheat the biscuit, but also give it more texture. The sausage gravy was ladled on top and finished off with a bit of paprika for color. You could definitely taste the smoothness and fattiness from the heavy cream and that may have helped to cut down the spiciness of the sausage as the heat was very mild. I for one would've loved a bit more peppery heat, but as it came, the biscuit and gravy was delicious. While I will be the first to acknowledge that I'm being the ultimate nit-picker here, you have to understand that in all of my other visits, Flury's Cafe had set the bar very, very high. I also know that in my conversations with Kim, she seems to understand that the Devil is in the details, if you will. You need to use the best products available to you, make as much as you can from scratch, and always be concerned that every dish you send out tastes and looks the best that it can. First, let me just say that I always love pairing something salty and something sweet. 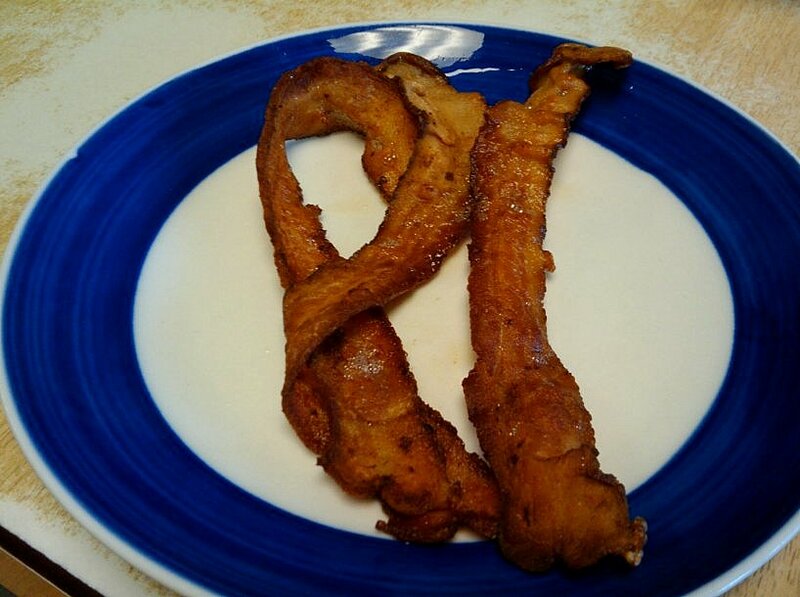 Bacon was a no-brainer to me because it also let me pair something crunchy with something creamy. The French toast had been made by dredging some of the Sarah Jane bread used by Flury's Cafe in a typical egg / milk / cinnamon batter and then griddled on the stovetop. Kim then took an actual banana, fresh from the basket, peeled it and placed it onto the griddle as well. The third component of the dish was the luscious sauce that would be poured over the finished toast. She combined butter, brown sugar, some vanilla syrup, and what turned out to be the most surprising twist of all, fresh lemon juice in a pan and let it reduce while the bananas and toast were cooking. 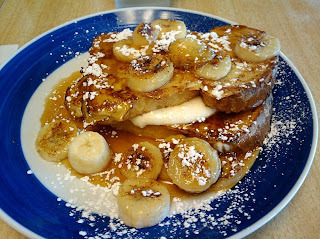 Once the first side of the French toast was cooked, she flipped them and then added the "stuffed" part of the dish: a mixture of cream cheese, sour cream, and powder sugar. After the second side finished, she assembled the entire affair, sprinkled the top with a bit of powdered sugar and brought it to me. The minute I tasted the sauce, I was mesmerized. Many times, breakfast syrups can be a little too cloying for my taste. The addition of the lemon juice tempered the sweetness and allowed me to taste more of the other flavors. The funny thing was that it didn't actually taste of lemon, but I could definitely tell there was an acid in the sauce. Alternating between bites of salty bacon and sweet French toast, I eagerly gobbled this up. Grilling the bananas had been an excellent idea as the some of the bananas were soft, some were firm, and the grilled pieces had a bit of caramelization from the sugars in the banana itself. Whereas my previous breakfast had a few areas that could use improvement, today's breakfast was spot on. I was fortunate that my server was paying attention and as soon as I had finished the French toast, she addressed my temptation to lick the plate clean by clearing it away. Having visited this eatery a half-dozen times now, I really can't recommend them enough. Even when the food wasn't perfect, it was still quite good and when the food was spot on (which has been every other time), it was absolutely marvelous. I have mixed feelings about the fact that in several days I will be starting a new job that will have me in Cleveland during the weekdays and I won't be able to get my weekly or bi-weekly Flury's fix. I guess that means I'll just have to start coming on Saturday's instead. I may never get a seat there with this glowing review. I'd better get over there soon before the crowds arrive. The food sounds incredible. I love little neighborhood places like this and I'm always happy when they succeed. My favorite place to get a good breakfast on the odd weekday that I have off from work. An Outrageous Meal At Ken Stewart's Lodge?